Want to raise a new family without the added expense? 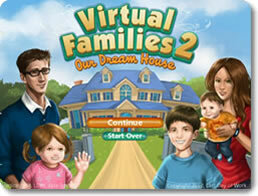 Then give Virtual Families 2: Our Dream House a tour. You'll discover a variety of little people living inside the depths of your computers and mobile devices. They need someone to help guide them through the ups and downs of life, provide a good home, and maybe find that special someone. Are you up to it? Do you think you have what it takes to adopt another family and show it the ropes from a computer screen? Their happiness, health and well-beings are literally in your hands, so you'd better decide wisely! You'll start things off by adopting your virtual protégé. These people each come with their own unique appearances, skill sets, assets, interests and plans for the future. Choose wisely what kind of person you want to adopt, for it will set the course for the rest of your game. Choose from hundreds of unique characters. Adopt people from all walks of life. Meet artists, lens crafters, web designers and more. Earn money by working from home. Practice the job enough to earn a promotion, becoming more skilled and getting paid more in the process. Develop your friend's behavior. Praise them for actions you want them to do, scold them for others you don't. Keep a close eye on your adoptee's mood. Make sure he or she is happy and healthy. Watch the inhabitants of your house work, clean up, relax, dance, have fun and so on. 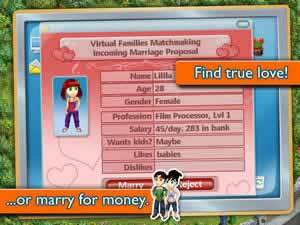 You're not playing Virtual Families 2 just to take care of one person. Over time, your little virtual friend will yearn for companionship. It will be up to you to find the right person for him or her, and to guide the two souls through a long and fruitful life. Accept marriage proposals from willing suitors. See if you can find the perfect match for your adoptee. Take control of both spouses' careers. Have them share a single job or take wildly divergent paths through life. Have kids between the spouses. Help your little lovebirds raise the little tykes right. Watch the children grow up and make families of their own. Follow the family's journey as new generations rise up and take ownership of the house. Home is where the heart is. Unfortunately, your home is going to need a lot of heart put in before it feels that way. It's damaged in most places, contaminated in others, and pretty bare all around. With enough hard work, your virtual family will be able to turn this place into a dream house that will be the envy of all the other people on your computer. Keep a clean house. Throw out the garbage, exterminate pests, clean up messes, and so on. Renovate your house. Open up the unlivable areas, add new rooms, build an outside deck, and more. Furnish your home. Buy dozens of sofas, chairs, tables and appliances. Spruce the place up with decorative paintings, rugs and plants. You can't put a price on love, which you'll find in great abundance with Virtual Families 2. There's a lot of depth in how the lives of these virtual people will unfold, and there are a lot of ways their home can be made. 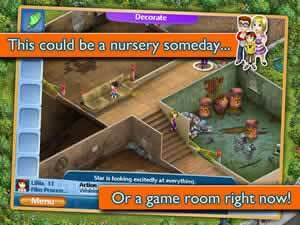 With equal parts virtual life and interior decoration, there's a lot of enjoyment to be found here for nurturing gamers everywhere.